As I was walking to the cinema to watch Incredibles 2 last Sunday, an exciting thought confronted me: ‘Wait! There’s going to be a Pixar short!’. Honestly, I might even prefer the shorts to the feature length films, and the latest creation Bao truly deserves to sit alongside others like For The Birds and Knick Knack. Originally I was going to write this review within my Incredibles 2 piece, but I think it deserves its own little post, so here goes. 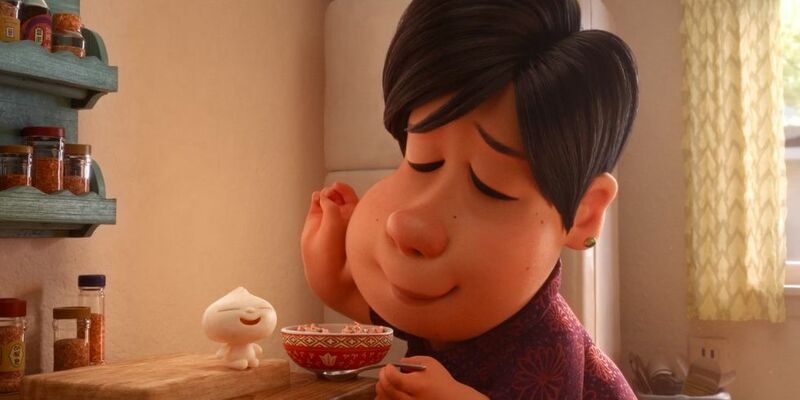 Bao tells the story of a Chinese woman making dumplings when one suddenly comes to life and she feels the need to raise it as her own infant. To reveal anything else would destroy the impact of the short, but yes, it is definitely as weird as it sounds. The film features no dialogue, and similarly to other Pixar shorts excels at visual storytelling. From the strangely proportioned character designs to how the mother’s expressions change both humourously and heartbreakingly, director Domee Shi genuinely has a bright career in animation ahead of her. Strangely though, what I came away from the short thinking about the most was the food. Much like that of Studio Ghibli movies, Shi has an incredible ability to make all of the Chinese dishes in her film look like the tastiest to have ever existed, from the detailed textures to the steam gently rising from the dumplings. Even a closeup of a fuzzy pink peach picked up by the mother character made me want to leave the screening at that moment and go to the nearest greengrocers. It’s likely that you will be seeing the Incredibles 2 regardless of this review, and if you do you will have to watch Bao whether you like it or not, though I can almost guarantee that you will. A heartfelt story of children flying the nest as well as an examination of maintaining one’s culture as an immigrant in a foreign land, Shi’s debut feature suggests fantastic things on the horizon.